Saunders Wilder, O., Sullivan, J., Johnson, K.T., Palumbo, R.V., Cumpanasiou, C., Picard, R.W., Goodwin, M.S. "Dyadic Physiological Interdependence and Social Reciprocity in ASD," International Society for Autism Research (INSAR), Rotterdam, Netherlands, May 2018. Howe, E., Pedrelli, P., Morris, R., Nyer, M., Mischoulon, D., Picard, R. "Feasibility of an Automated System Counselor for Survivors of Sexual Assault," Connected Health Conference, Boston, MA, October 2017. Lopez-Martinez, D., Rudovic, O., Doughty, D.V., Subramony, A., Picard, R. "Automatic pain intensity estimation using multi-modal data from wearable sensors," American Pain Society. Pittsburgh, USA, 2017. Picard, R.W., Migliorini, M., Caborni, C., Onorati, F., Regalia, G., , Friedman, D., and Devinsky, O. 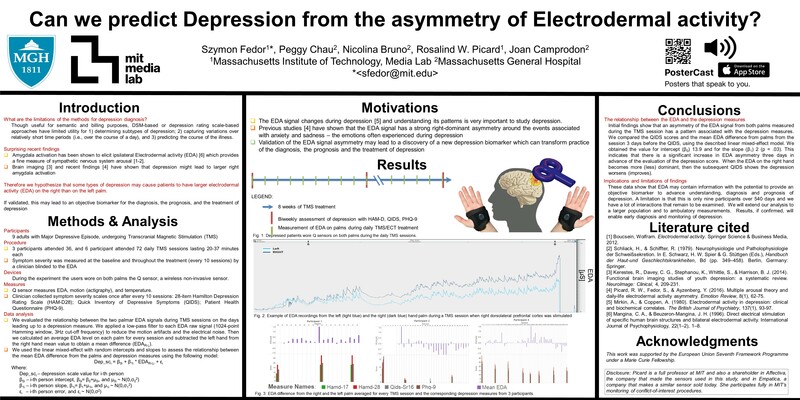 "Wrist sensor reveals sympathetic hyperactivity and hypoventilation before probable SUDEP" Neurology; published ahead of print July 12, 2017, doi:10.1212/WNL.0000000000004208: 1526-632X. Unformatted draft, PDF Final copyrighted report Patients and families should be told that SUDEP can happen in the minutes following a seizure, and if somebody is there to immediately stimulate, reposition, or provide first aid, the patient may have a better chance of survival. Sarkis, R., Thome-Souza S., Poh, M-Z., Llewellyn, N.,Klehm, J., Madsen, J.R., Picard, R, Pennell, P., Dworetzky, B.A.,Loddenkemper, T., and Reinsberger, C. "Autonomic Changes Following Generalized Tonic Clonic Seizures: An Analysis of Adult and Pediatric Patients with Epilepsy," Epilepsy Research, September 2015. M. Eckhardt, and R.W. Picard, "A More Effective Way to Label Affective Expressions," International Conference on Affective Computing and Intelligent Interaction (Demo Session), 2009. K. Kim, M. Eckhardt, N. Bugg, R. W. Picard, "The Benefits of Synchronized Genuine Smiles in Face-to-Face Service Encounters," IEEE International Conference on Computational Science and Engineering, vol. 4, pp. 801-808, 2009. Daily, S.B.,"Cultivating Empathy: Incorporating Social and Emotional Learning in a Technology-based Curriculum," Poster presented at 2nd Annual Inter-Science of Learning Center Student and Post-Doc Conference. Seattle, WA, February 5-7, 2009. Millner, A., & Daily, S. B., "Creating an Educational Ecosystem for Design, Fabrication, and Invention," In P. Hildreth & C. Kimble (Eds. ), Communities of Practice: Creating Learning Environments for Educators (Vol. 1), Charlotte, NC: Information Age Publishing Inc.
Daily, S.B., Headen, I. "Toward the design of a computational platform to foster student-teacher relationships," Presented at Harvard Student Research Conference, Cambridge, MA, March 13, 2008. Prewitt, A., Daily, S.B., and Eugene, W. "Minority Retention and Success in Engineering: Diversifying the Pipeline through the Development of Social Capital," Proceedings, 2007 ASEE Annual Conference, Honolulu, HI, June 24-28, 2007. PDF WINNER OF BEST PAPER PRIZE. El Kaliouby, R., Picard, R.W., and Baron-Cohen, S. "Affective Computing and Autism," Progress in Convergence. Eds. W. S. Bainbridge and M. C. Roco, Annals of the New York Academy of Sciences 1093: 228-248, doi:10.1196/annals.1382.016. Tao, J., Tan, T., and Picard, R.W. "Affective Computing and Intelligent Interaction," First International Conference, ACII 2005, Beijing, China, October 22-24, 2005, Proceedings Springer 2005. TOP 10 BEST PAPERS FROM 2000-2009 of the IEEE TRANSACTIONS ON INTELLIGENT TRANSPORTATION SYSTEMS. A. Sherstinsky and R.W. Picard (1998), "On Stability and Equilibria of Analog Feedback Networks," IEEE Transactions on Circuits and Systems, Volume 45, No. 4, pp. 408-415, 1998. R.W. Picard (1997), "Affective Computing," MIT Press, Cambridge, 1997, The bibliography from this book is available online. R. W. Picard (1997), "Does HAL Cry Digital Tears? : Computers and Emotions," chapter in Hal's Legacy, Ed. by D. Stork. The computer HAL was the most emotional character in Kubrick & Clarke's 2001: A Space Odyssey. This book contains chapters by Ray Kurzweil, Roger Schank, Doug Lenat, Azriel Rosenfeld, Don Norman, Dan Dennett, and other leading experts on areas where Hal has inspired research, together with an interview with Marvin Minsky, and a forward by Arthur C. Clarke. J. Riseberg, J. Klein, R. Fernandez, and R.W. Picard (1997), "Frustrating the User on Purpose:Using Biosignals in a Pilot Study to Detect the User-s Emotional State," CHI 98, late-breaking short paper. Before 1997, most of the research publications for Picard and her research assistants focused on image and video analysis, texture models, computer vision, pattern analysis, signal processing, and content-based retrieval, without deliberate consideration of affective information.These earlier publications can be found on the Old Vision & Modeling Group Tech Reports list (scroll down for original "classic" work).